A Discoverer Of The Buckyball Offers Tips On Winning A Nobel Prize Harold Kroto shared a Nobel in 1996 for finding a new type of carbon molecule that ignited the field of nanotechnology. Find a passion where — with hard work — you can be the best, he advises. The Nobel Prize has a special aura. Winning one instantly certifies you as someone who has reached the pinnacle of science. But what does it take to win the prize? And what does it do to your life? There are different answers for every scientist, of course. But for Nobel laureate and chemist Harold "Harry" Kroto, some of the answers might surprise you. I never give up. Of course, you've got to know if there's a brick wall in front of you. But, there's not often one. Never, ever give up. "I've always felt that the Nobel Prize gives me nothing as far as science is concerned," Kroto told me when I visited him earlier this year in Tallahassee, Fla.
That's because most Nobel laureates have well-established scientific careers by the time they win the prize. 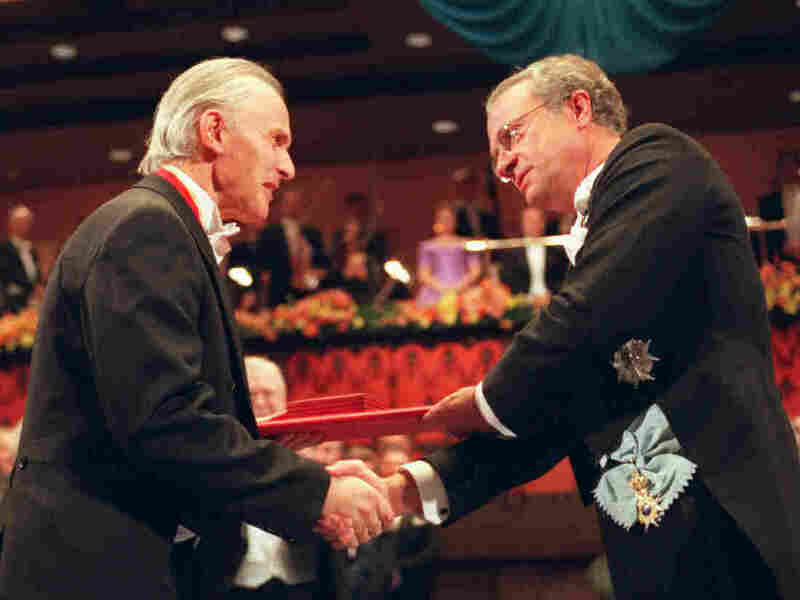 Kroto won the chemistry Nobel in 1996 for a discovery he and two colleagues made more than a decade earlier. Kroto and Robert Curl, of Rice University, and another Rice chemist — Richard Smalley, who died in 2005 — found elaborate forms of carbon molecules, known as fullerenes, that arrange themselves in closed shells. Buckminsterfullerene, or the buckyball, is the best-known. It's named for its similarity in shape to Buckminster Fuller's geodesic dome. The trio's Nobel discovery of buckyballs, and the possibility that these molecules could be used as cages to store or transport other chemicals, helped kick off the field of nanotechnology. Kroto was born in Wisbech, Cambridgeshire, in the United Kingdom. He did his undergraduate and graduate work at the University of Sheffield. In 1996, just prior to winning the Nobel, he was knighted by Queen Elizabeth for his contributions to chemistry — so he's more properly known as Sir Harold Kroto. 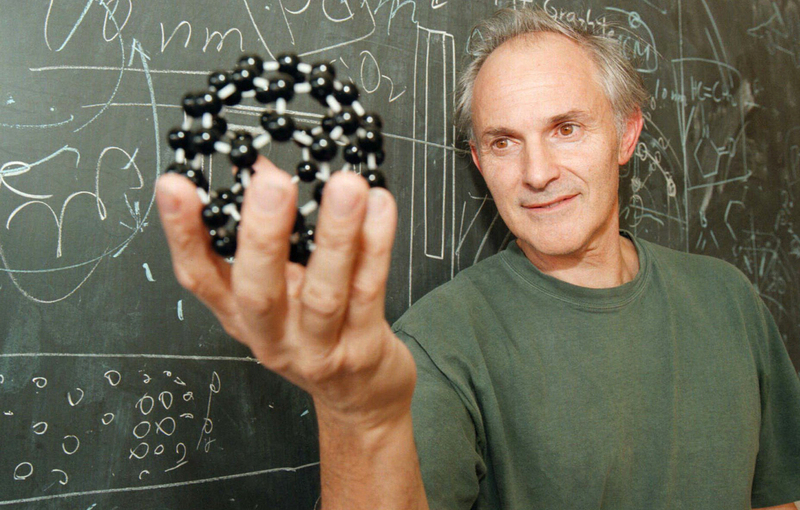 Kroto displays a model of his discovery in 1996: a soccer ball-shape carbon molecule that spawned a new field of study and could act as a tiny cage to transport other chemicals. Since 2004, Kroto has been on the faculty of Florida State University. "I was hoping to stay at Florida State for a couple more years," he told me, "but I've got health issues so we're going back home to the U.K."
Kroto just turned 76. In my experience, some Nobel Prize winners can be a bit full of themselves, but Kroto is very down-to-earth. If the prize didn't do anything for his scientific career, he said, it did put a burden of responsibility on him. "Because, certainly, wherever you go, young people in the sciences listen to Nobel laureates," Kroto said. "And I think I have things to say which are important to me and to them and to society." He makes a point of showing up at events where young people will listen, like science fairs. "I think the most important thing that young people should be taught at school is how they can decide what they're being told is true," he told an audience of about 1,500 science-fair finalists last year at the International Science and Engineering Fair. And he offered listeners another life lesson: "If doing something with second-rate effort satisfies you, find something else to do — where only your best effort will satisfy you personally. "That's basically it," he told the students. "And I think that's a recipe for being at least satisfied with what you do in life." Not being satisfied with second-best certainly defines Kroto's character, and probably played an important role in propelling him to the Nobel Prize. He was a good enough tennis player to dream of winning at Wimbledon, he said, but also realized it was a dream he'd never fulfill, because, as he put it, "I kept losing." It was the same with playing the guitar. "I wasn't too bad," Kroto told me. "I could play in a folk group. But then Eric Clapton came along and made me look like someone with honey stuck on their fingers." Kroto sets a high bar for himself, but that's the point. For him, playing at Wimbledon meant being able to win at Wimbledon. Playing the guitar meant being able to play with the best — the likes of Eric Clapton or Ry Cooder or Andres Segovia. Ultimately it was in science that Kroto felt he was on a par with the best. There is one other field where Kroto thinks he excelled: graphic arts. And there's nothing incongruous, he believes, about a scientist interested in art. "Art and science are intrinsically the same except for one thing," Kroto told me. "The universe is in control of your science, whether it's right or wrong, and the public are in control of your art — if they're going to buy it, if you're going to make a living that way." Whatever the public might think of Kroto's art, the universe seems to have thought very well of his science. There's one other important thing to know about Harry Kroto if you're hunting tips for winning a Nobel. "I never give up," he told me. "Of course, you've got to know if there's a brick wall in front of you. But, there's not often one. Never, ever give up." Who knows what beautiful discoveries might lie ahead.